It is weekend and more time again for kitchen experiments. I feel I need something without meat or even fish. The whole week I have wanted something in the lines of a cake, a pie or something else baked but have resisted the temptation. A veggi pie today perhaps? So I hit the market. It is June and the counters at the Farmers Market have made space for piles of orange fresh new carrots. These thin sweet roots are “knackig” (Ger. ), crisp and juicy and best enjoyed raw. Somehow I suspect that the bigger thicker carrots further away that are not sold in a bunch and don’t have the green leaves but are equally bright orange, hard and clean of soil are from the last harvest. I am really embarrassed that I am doubting this…I should know this. My logic of the agricultural calendar says they must be from last year’s harvest but as a consumer it can be confusing as they look the same all year round. Old or new crop today is carrot time. I’ve grown up with carrots. Carrots grow in the northern latitudes and are a common vegetable, besides potatoes of course, in Estonia. 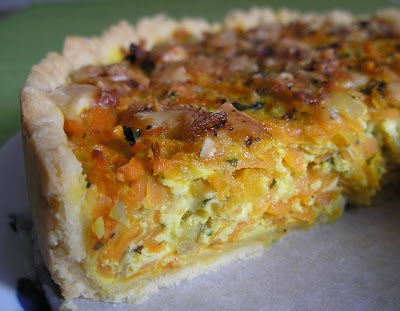 My Mom used to make carrot pies and my aunt, who had a real stove with an oven that was heated by wood, used to make small carrot pies that were juicy soft and looked like small shiny golden brown pouches. We call them pies, picture them as empanadas filled with carrot and egg and sometimes some bacon. I buy my carrots, Italian flat parsley – onions I have at home – for the pie and some strawberries for dessert. I see some big free range eggs and get half a dozen. Somehow I’ve always thought that the eggs at the market are more expensive, but no. So I’m thinking that from now on, I will take my egg business to the market. Chop the cold butter in the flour and salt mix into small pieces. A two pinch salt = a pinch between two fingers. Add the egg yolk and 1tbl spoon water. Mix all into a dough, wrap into the plastic foil and leave in the fridge for 30 minutes. Clean and chop the onion rather finely but the fineness and equal piece size is not important at all. Peel the carrots and grate with the rough side. Very thinly grated carrot will lose the bite. Heat the oil in a pan and fry the onion slightly. Add the grated carrots to the onion and cook for about 5 minutes till carrots are softer. Add some salt and pepper, chopped thyme, curcuma (about a three pinch) and as last the parsley. Taste for salt as the carrots have a natural sweet taste. Chop the parmesan into small chunks. In this recipe I replaced the usually grated cheese with chunks of Parmesan to give the filling a crunchier texture. Mix the eggs, add the milk and some salt. Roll the dough into a thin layer and fit into a 24-26 cm diameter baking form that is fitted with baking paper to avoid sticking to the bottom and sides. Layer on the dough half the carrot mix, half the chopped parmesan, then carrots again and on top parmesan chunks. Pour the egg-milk mixture on the carrots. Cook in the oven for 30 minutes or until the filling is cooked and the cheese on top is turning golden brown.